On days when I plan to be at the beach or pool I’m sure to cover every inch of my body with sunscreen – several times a day. I bring along the big Scarlett O’Hara hat, too, making sure my face has even more protection then the rest of my body – you can never be too cautions when it comes to preventing wrinkles. On those days when I’m ultra-prepared, I know that I’m taking good care of my skin. But there are those days when “I’m going to run to the market” turns into lunch with my friend on a café patio to catch up. And, of course, catching up spills into a walk in the park and before I know it, I look like a lobster and I have tank top and flip flop tan lines! Luckily, I have more days when I know I’m going to be in the sun and I’m prepared to battle UVA and UVB rays. How can we make sure that we’re always prepared to stand in the sun instead of shriveling up with sunburn? Slip on a shirt – Cover your skin as much as possible. Slop on sunscreen – Use a broad spectrum sunscreen to fight both UVA and UVB rays and make sure that it has a SPF of 30 or higher. A morning application isn’t enough, so make sure you reapply throughout the day. Be sure to check the expiration date on sunscreen, too! Slap on a hat – A hat with a 2 to 3 inch brim is ideal because it protects your ears, eyes, forehead, nose and scalp. These are the areas that are exposed to intense sun and are most likely to burn. 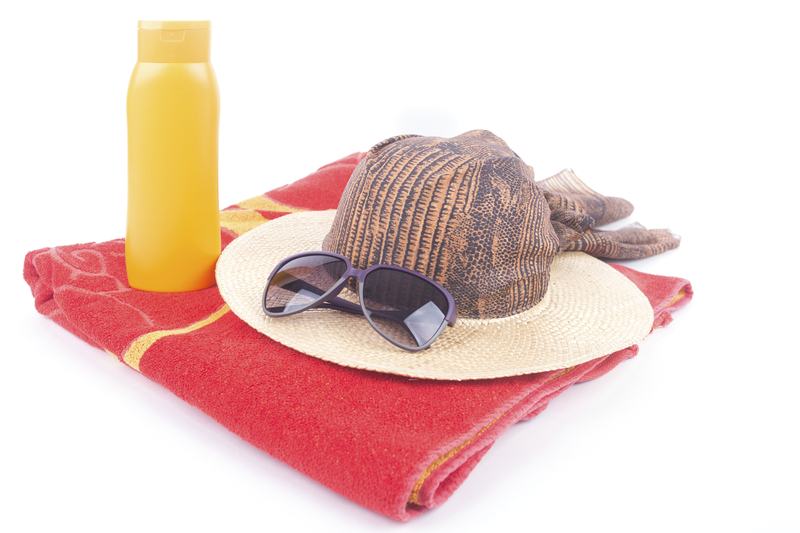 Wrap on sunglasses to protect your eyes and the sensitive skin around them – UV blocking sunglasses are important! Make sure your shades block 99-100% of both UVA and UVB rays; labels on your sunglasses will let you know if they are meeting this standard. Large Jackie-O glasses or wraparound glasses are more likely to prevent sun coming in at different angles. It should go without saying that we should also avoid tanning beds and sun lamps. If you are looking for a healthy summer glow, try a spray tan or self-tanning lotions. “Slip! Slop! Slap! and Wrap!” That’s all I need to remember every day to make sure my skin stays healthy year round.